Many businesses underestimate how the coolroom shelving system they select impacts the safety and productivity of their workplace. Coolroom shelving (also known as cold room storage) is essential for any business that requires foodstuffs to be stored, whether dry, cold or frozen. When storing food and drinks for human consumption, it is important to be compliant with all health and safety regulations, while also choosing a system that is functional, easy to use and of high quality. This can be daunting if you have never shopped for cold room shelving before, but our storage systems can offer you all of the above and more. Temperature senstive products and perishables require special attention when it comes to the way they are packed and stored. With our range of HACCP approved shelves for freezer and refridgerated areas you can be sure you are taking all neccessary precautions to ensure your customers are consuming safe food and drink. With over 20 years of experience in the coolroom storage and shelving industry, we can help you with all stages of your decision making, from the selection process, to supply, delivery and installation of your food storage system. Whether you need light duty coolroom shelving for a small shop or are storing heavy items in the long term, we have a system that will suit you. For a light duty coolroom storage system with up to 100kgs load capacity per shelf, our wire shelving is the system for you. This system is zinc plated, rust resistant and also has the option to add castors for ease of movement. This type of shelving is commonly seen in small cafes, restaurants and milk bars. 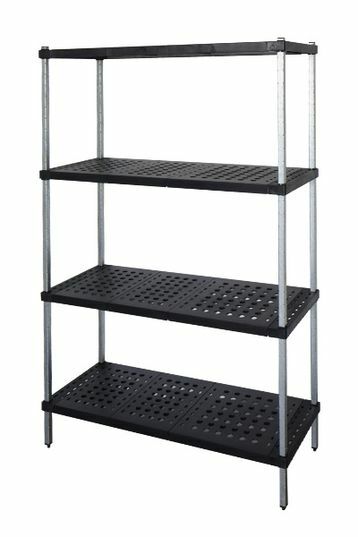 Our light duty shelving is multi purpose and can be used for both coolroom and dry storage. With a weight rate of 80-100 kilos per shelf when distributed evenly and flat packed for easy transport, this system is perfect for small businesses that store perishables. If you are storing heavier items, a storage system with a higher load rating per shelf will be better suited. Our heavy duty wire shelving system holds up to 200kgs per shelf, our M-Span holds up to 200kgs or Tuff Shelf holds up to 250kgs. Our Tuff Shelf range is particularly versatile and easy to use because it has removable shelves that can be washed separately or placed in the dishwasher. 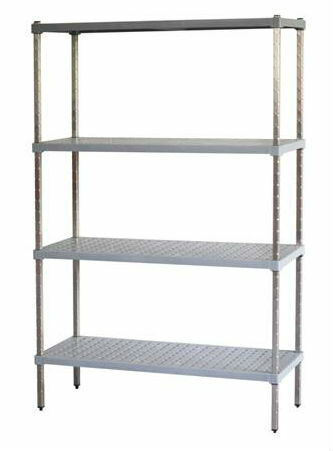 This type of shelving is commonly seen in large restaurants, hotels, take away and fast food shops and service stations. If you need to store heavy items off the floor, take a look at our Dunnage shelving which holds up to 450kgs per shelf. Our heavy duty range comes in various heights and lengths, so please contact us with your requirements and we will get back to you with a very competitive price. Feel free to bring in or email your floor plans with relevant dimensions so we can assist in choosing the coolroom system that is right for you. There may be storage options that you haven't considered such as corner shelving to make the most of the space you have, or other accessories that enhance your cold room storage unit. There are many options available when it comes to choosing what is right for your business, so please come and see our experts to ensure you choose the cool room shelving and dry storage system that is right for you.